In this study, the sensing properties of multi-walled carbon nanotube (MWNT)-latex thin films were characterized and optimized. These sensors were fabricated by airbrushing MWNT-latex ink solutions. Films of various sizes and patterns can be deposited onto a variety of structural surfaces. First, thin films of different MWNT concentrations were spray-coated. Second, specimens were subjected to tensile cyclic loads, while their resistance time histories were recorded. In addition, films were also thermally annealed, which was found to prevent resistance drifts during long-term strain monitoring tests. 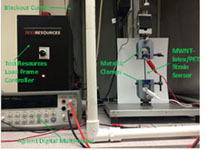 The films’ strain sensing properties (e.g., sensitivity, linearity, and repeatability) were characterized with respect to MWNT concentrations, annealing, load cycles, and load rates. The results showed that annealed films were capable of achieving linear, repeatable, and long-term strain sensing.